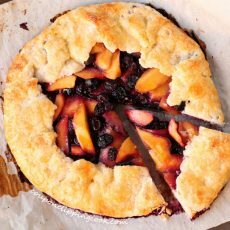 You wont believe how easy it is to make this wonderful homemade galette! In a medium to large size bowl, add the flour, sugar, salt and stir together. Using a grater, shred the frozen butter and add it to the bowl. Using a fork or pastry cutter, cut the butter into the flour mixture until there are medium to large size crumbles (from the butter) in the mixture. To the bowl, add lime juice and water. Stir together. Knead the dough a few times and form it into a round. Wrap it in plastic wrap and chill the dough in the refrigerator for an hour. Rolling out the dough - Sprinkle flour on the rolling surface and on the rolling pin. Roll out the dough into a large circle (about 2 inches larger than the diameter of a pie pan). Transferring the dough - Add more flour to the rolling pin and lay it on top of either the left or right edge of the dough. Roll the dough on to the rolling pin towards the opposite side, and transfer it to a parchment paper lined large cookie sheet or pizza pan. Unroll the dough on the parchment paper and set aside for a moment. Peel the mango and cut the flesh off of the pit in large pieces. Cut the mango flesh into slices that are about 1/2–inch thick. In a medium size bowl, add the mango, blueberries, lime juice, sugar and ginger. Gently stir together until incorporated. Using a slotted spoon (so not to include the juice), transfer the mango mixture onto the center of the pie dough out to about 3 inches from the edges of the dough. Fold in the edges of the pie dough (the edges without any filling on it) toward the middle of the galette to form a "ring" of pastry around the outside edge. Adjust the dough if needed so that the amount of dough folded over the filling is about the same width. In a small bowl, whisk together egg and water to make the egg wash. Brush the egg wash around the "ring" of pastry. Sprinkle sanding sugar over the pie crust and filling. Bake in a preheated oven until the crust turns a golden brown (about 40 minutes). It’s okay if the juice from the blueberries seeps out of the crust on the parchment paper while it’s baking. Serve warm topped with whipped cream, ice cream or just on its own.